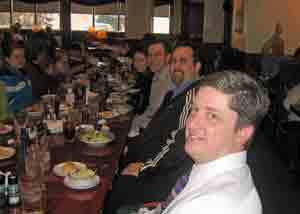 On Sunday, January 18, I did a Biblical Creationism Mini-Seminar at Hope Spring Baptist Church in Maplewood, MN. The above picture is of the Peterson family with whom I had the pleasure of spending a portion of Saturday and Sunday, January 17-18. 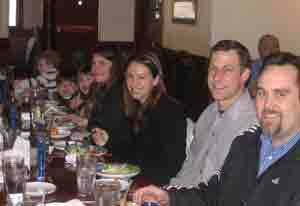 Pictured are Jeff and Jenny, along with their three engaging sons, from oldest to youngest: Justin, Jeremiah and Jack. Since I have four granddaughters, I forgot what it was like to have children interested in GI Joe. They brought some sunshine to a couple of cold days in Minnesota. While serving as an assistant pastor at First Baptist of Sterling Heights, Jeff attended Detroit Baptist Theological Seminary and graduated from seminary in 2005. Shortly after graduation, he returned home to Hugo, Minnesota in order to start a local church in that area (for more details, go here). I had Jeff for a number of classes, including Biblical Creationism, and can testify that not only did he do well academically but he is also serious minded and has a heart for exalting the gospel of Christ in evangelism and edification. The opportunity to speak at Hope Spring came up in conjunction with my trip to Central Baptist Seminary for the Ecclesiastes seminar module. After picking me up in Plymouth on Saturday morning, January 17, we went to the Peterson’s and were able to catch up on old times and to see how grown-up their sons had become since I last saw them, which conversely reflects that I am getting old. 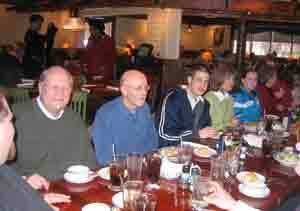 Then on Sunday, January 18, I did a Biblical Creationism Mini-Seminar. I gave two messages: “Genesis 1 and Creation” and “The Impact Noah’s Flood Has On Our World Today” (for details go to their website Hope Spring Church). After giving both messages, we also had a short period of Q & A session that spilled over after each session. This was a very good time of interaction and it helped me to become better acquainted with the people at Hope Spring Baptist Church. The church meets at White Bear Armory in White Bear Lake, Mn. 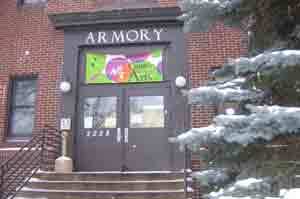 Here is a picture of one the entrances to the Armory. The place is well set up to meet the needs of a church in its early stages of growth. Unfortunately, I had some difficulties with my camera and the pictures that I took from inside the Armory were too bad to use. 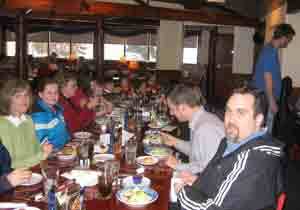 After the Sunday morning service, we went to a nearby Red Lobster. Though I was unable to get everyone in the pictures and a Red Lobster is not the place where everyone is at their photogenic best, here are a few pictures to acquaint you with the saints at Hope Spring Baptist Church. Church planting is hard and at times rewarding work. 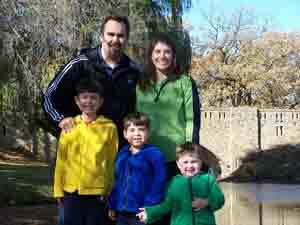 The Peterson’s have been able to gather seven to eight solid families who are committed to Hope Spring Baptist Church. The nucleus at their church looks like they have a good group of people to reach their area with the gospel of Christ. It would be great if you would remember to pray for the Peterson’s and the good people at Hope Spring Baptist Church. And, if you are in the Maplewood area of MN, I would strongly recommend that you plan to visit their church. On January 14-16, I had the opportunity to lead a PhD module seminar on Ecclesiastes at Central Baptist Theological Seminary in Plymouth, MN. I enjoyed getting better acquainted with their faculty (for a list of the faculty, click here). 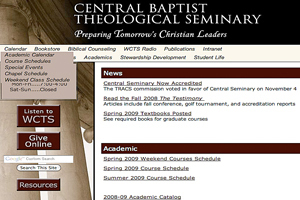 Two of Central’s faculty members are Detroit Baptist Theological Seminary graduates: Dr. Dan Brown, who graduated with a Master of Divinity degree in 1982 (a year before I began teaching at Detroit), and Dr. Jeffrey Straub, who graduated with an MDiv in 1994 and then did classroom work in our ThM program. One of the classes that I taught Dr. Straub was a ThM Hebrew Exegesis of Micah in the Fall of 1996. Besides being a WYSIWYG person, one of the things I remember most about Dr. Straub was his intermittent mantra: “Don’t sweat the dagesh” (a dot that is inserted at key junctures in the middle of Hebrew letters). This proverb was good for a laugh or two in the 1990s; however, it was even funnier when one of the students on the first day of the seminar asked me if I sweat the dagesh. At that point, I knew that I had been set up. It was good to renew friendships with the faculty and staff at Central. I had two students in the seminar: Gelu Pacurar, a pastor from Arad, Romania, and Tim Little, an adjunct faculty member at Faith Baptist Theological Seminary and assistant bookstore manager. In the following picture, Tim owns the Macintosh and Gelu has the other computer. 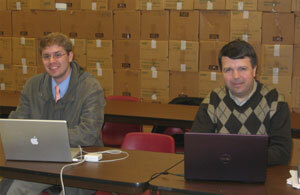 Each day, the students had to be prepared to orally translate from their Hebrew Bibles four chapters in Ecclesiastes. In addition, they lead discussions on key introductory and interpretative issues in Ecclesiastes. When the class is concluded on April 13 & 14, each student will present a term paper, respond to the other student’s paper, and do a critical book review. I am pleased with the effort that both Gelu and Tim exerted in the seminar and I found the interaction refreshing. I may have been refreshed, however, because I have learned as a seminary professor that it is more blessed to give than receive. If you want to check out the course requirements, clickhere. Earlier today, I uploaded a list of 469 Hebrew words that are designed to be used with Allen Ross’s Introducing Biblical Hebrew. This word list is the vocabulary found at the end of each of 39 lessons, two through forty, in his text. I have set up the vocabulary to follow the lesson arrangement and word order in each of Ross’s lessons. However, I have made a couple of additions to his vocabulary. First, I have provided a greater sampling of the semantic range for the majority of words from HALOT. Second, I have cross-referenced each lexeme with the corresponding page number(s) from the two-volume edition of this lexicon. To download a copy of this pdf file, click Elementary Hebrew Grammar Word List. Because of my academic schedule, I have not had much time to blog over the past couple of months. To get caught up, I want to go back a couple of months. On Monday, October 27, Dr. Bill Combs and I were privileged to meet and have coffee with Dr. Peter Williams, the Warden at Tyndale House, Cambridge (to read more, click here). 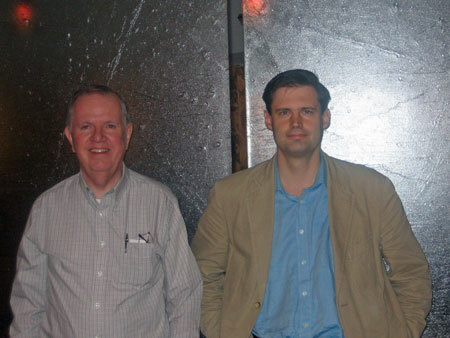 Dr. Combs and I had read an itinerary about Dr. Williams’s Oct-Nov trip to the US, which included the Detroit area, and had hoped to meet him (you can read about his recent trip to the US in the 2008 autumn newsletter of Tyndale House). Dr. Combs and Dr. Williams had some interaction in 2007 about an article that Combs had posted at Evangelical Textual Criticism Blog on the subject of Biblical preservation (this is a condensation of a larger journal article (for the article, click here) that appeared in the 2000 edition of the Detroit Baptist Seminary Journal. Because of their previous interaction, Dr. Combs emailed Dr. Williams to see if we might meet while he was in the United States. In a March 2007 Christianity Today article, D. A. Carson, Research Professor in New Testament at Trinity Evangelical Divinity School, made these glowing remarks: “I am delighted with this appointment. Not many scholars can speak competently across as many technical fields as can Pete. His resolute commitment to Christ and to his Gospel, combined with his administrative and people skills, make his appointment a cause for celebration. I anticipate that the best days of Tyndale House are still ahead.” Though Dr. Combs and I had a limited time with Dr. Williams, it was profitable meeting. This past fall semester, I was teaching first semester of Elementary Hebrew Grammar. After learning the Hebrew alphabet and vowel points, some of the issues that I face is getting the class to recognize basic syllabification and the proper use of vowel points. My class awareness of these issues needed reinforcement so I pointed them to Dr. Williams post “The Great Pointing Crisis.” Since then the class have gotten with the program. It was a pleasure for Dr. Combs and I to meet Dr. Williams and we look forward to his future contributions to biblical scholarship.